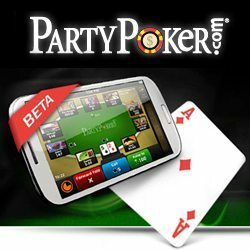 PartyPoker is a well known online gambling establishment featuring a popular online casino as well as a world class poker site. While they have made a name for themselves as a safe and trusted place for gambling, Black Friday has caused them to raise the bar even higher. The indictments a couple months back have shown them an opportunity to earn customers that might not feel comfortable playing on Full Tilt Poker or PokerStars for the time being. Right now PartyPoker is attracting people with their Big Draw promo. As usual you earn points for playing real money poker games, and the points get you tickets for the daily prize draws. There is half a million in prizes up for grabs, and some of them are truly impressive. For example, you could potentially win a 46 inch television or an iPad! There is a prize draw every day. You must earn a ticket the same day as the draw to be eligible for it. A cool surprise: all the tickets you earned since the start of the Big Draw promo will be included in the daily draw as long as you have earned at least one new ticket that day. To win the huge prizes, though, you will need to be in the Weekly Mega Draws. The month of June will have them every Sunday and the prizes will blow you away. This coming Sunday’s draw has a VIP Vegas trip up for grabs. The following weak features a cruise to the Caribbean for you and a guest. Those prizes are super small compared to the second half of the month, however! The 19th of June might see you winning a Harley Davidson Fatboy motorbike. And then the last Mega Draw of the month is just crazy: you could win a Porsche 911 Carrera! Keep in mind that you may have to wait a couple days to know the daily winners. With a series of draws happening every day, it is possible to win more than one prize per day! It should be clear that you would do best to play a TON of poker this month so that you can receive tons of tickets. When you win a prize, you actually get a certain sum of money deposited into your account. You must contact PartyPoker support in order to trade the money for the prize you were supposed to win. The prize is often worth more than the money they give you, so you will probably want to email support. The actual cash might appeal to some people, however, so you can decide based on your personal situation. If you decide to play on Party, do it quickly since the draws are only for the month of June! People often choose poker rooms based on game selection and poker bonuses<. Some sites are great when it comes to cash games, and tournaments might be a bigger priority for other sites. If you also really enjoy live games, the chance to satellite into live events might also be a priority. There have always been live satellites on PokerStars, but recently they made it even easier to get into the biggest events around the world. A previous entry stated that PokerStars is not offering any WSOP promotions this year. Those still looking to satellite into the WSOP Main Event will not find any WSOP satellites on PokerStars. It is still possible to win a Main Event seat on PokerStars, however. You get to Vegas by winning a Main Event Passport. The Main Event Passport is not limited to just the WSOP. Winning a Main Event passport lets you choose between the WSOP and then all of the PokerStars tours. The PokerStars tours available include the PCA, EPT, LAPT, and APPT. The Main Event Passports are valued at $13k. You get both cash for expenses and a seat to your Main Event of choice. Hotel accommodations are only included in select packages. In cases where hotel is not included, you can simply use some of your expense money to cover it. It might help you to know that the PCA and EPT London packages are valued at more than $13k. Since PokerStars is covering the difference, you might want to take advantage of their generosity by choosing one of these events. It costs as little as $2.00 to win your way to a Main Event Passport. If you are good at sit-and-go’s, you should give Step Satellites a shot. Steps are popular because you can choose to start small, medium, or large depending on how many total satellites you wish to play. For a risk free path to a Passport, play one of several FPP satellites. Before playing any of the Main Events, you must sign a waiver form. The Passports and event packages are non-transferable and usually cannot be exchanged for cash. The WSOP package is an exception; you receive $13,000 cash in your account if you choose it above the others.